Your marriage and the marriages around you are colored by personalities, passions and experiences. Making marriage work is a divinely inspired art form. 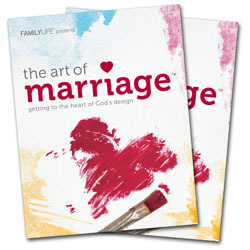 That's why FamilyLife created The Art of Marriage video event. Biblical content and practical applications give couples a fresh perspective on married life that has proven to have a significant impact on marriages. In participant surveys, 97 percent agree they would recommend The Art of Marriage event to other couples. The six session one-day or weekend event weaves together expert teaching, real-life stories, humorous vignettes, man-on-the-street interviews and much more to portray both the challenges and the beauty of God's design. An accompanying manual (sold separately in sets) includes projects, articles, and tips to help couples live what they learn. 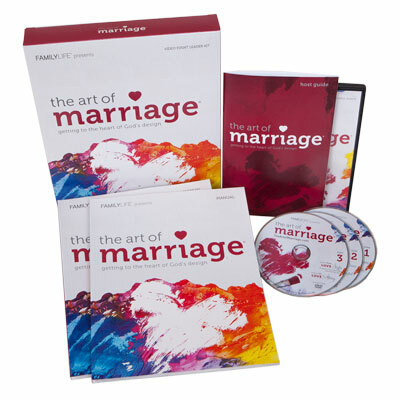 Crafted for use in a church or community, The Art of Marriage® video event can be organized for heart-changing impact by a local pastor or lay couple. Purchase additional The Art of Marriage® couple's sets for your event. Purchase the Spanish edition (dubbed audio).